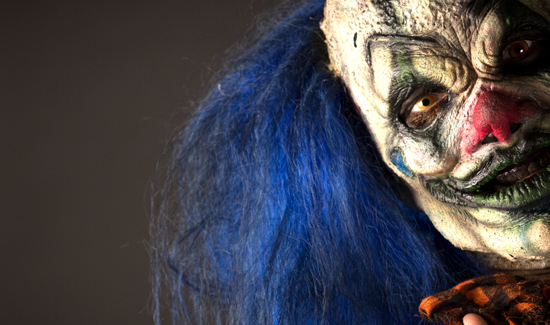 Forget about ISIS, sharks, and home invaders—the brand new number one threat to public safety is creepy clowns. Anyone trying to find out what happened during last night’s VP debate (almost nothing) had to scroll past all the clown crap in the Facebook “news” feed to get to it. The White House has weighed in. Law enforcement in Utah is warning people not to shoot the killer clowns on sight. “Causing panic and fear in public especially to children is dangerous, and could cause someone to get hurt, cause a crash, or prompt unnecessary tensions between a prankster and a person who becomes frightened,” warned The Martin County Sheriff’s Office in Florida. But the best reaction to all this nonsense is from Sacramento County Sheriff’s spokesperson Sgt. Tony Turnbull in California. As is almost always the case, people prefer the fake threats to public safety as opposed to the real ones. That’s why it’s called “social” media.